Yellow pea shipments to India must be certified free of D. dipsaci. Photo by Bruce Barker. A microscopic worm that caused market access issues for yellow pea growers is not what it seems. The stem and bulb nematode, Ditylenchus dipsaci, is a quarantine pest and can attack a wide range of food crops including pea, lentil, onion, garlic, carrots, sunflower, and others. In 2004, when D. dipsaci was detected in Canadian yellow peas, India required every shipment of yellow peas from Canada to be checked for and certified free of the nematode. If the pest was found, the ship carrying the peas would have to divert to a third country to be fumigated to destroy the nematode before it could deliver its cargo to India. “When the nematode was found in yellow pea by the Canadian Food Inspection Agency it was thought that the nematode was D. dipsaci. However, we suspected it was another species,” says Mario Tenuta with the department of soil science at the University of Manitoba. Symptoms of D. dipsaci infestations on pea include swollen and distorted stems and petioles, with distinct lesions that are brown to black. Discoloration and distortion of pods and seeds are also observed. In 2010 a Russian scientist identified a species of nematode that was very similar to D. dipsaci. This species, D. weischeri, was found on creeping thistle (also known as Canada thistle). With funding from the three Prairie pulse grower associations and the Alberta Crop Innovation and Development Fund, Tenuta led a two-year project to determine the species of stem and bulb nematode and its frequency in fields of the Prairie Provinces. A previous study across the Prairies had linked the presence of stem and bulb nematode with creeping thistle seed in yellow pea samples. DNA analysis by Tenuta’s lab confirmed that the Ditylenchus species in yellow pea harvest grain samples, and creeping thistle seed from pea fields and roadsides was D. weischeri. 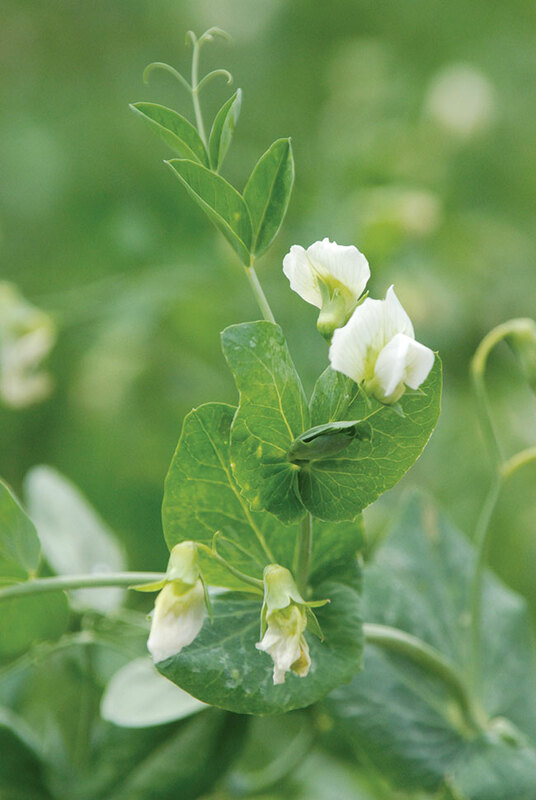 Subsequently, CFIA conducted DNA testing on Canadian yellow pea samples dating back to the first detected nematode in 2004. All came back identified as D. weischeri. To date, no D. dipsaci has been identified in Canadian yellow peas. Greenhouse studies also looked into potential crop hosts and impacts by D. weischeri. The trials confirmed that D. weischeri readily parasitized and reproduced on Canada thistle but not yellow pea, large green lentil, Kabuli and Desi chickpea, garlic, spring wheat, and canola. The good news for yellow pea growers is that D. weischeri is not a quarantined pest nor does it appear to cause damage to yellow pea. However, D. dipsaci is still a quarantine pest. In eastern North America D. dipsaci causes complete loss of garlic fields.